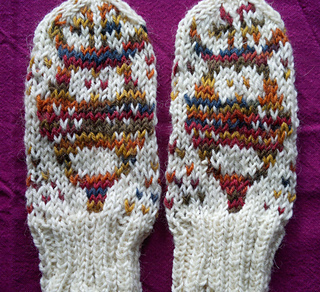 Ravelry: Children's Reindeer -mittes pattern by Milla H.
Children's Reindeer -mittes by Milla H.
Here are my version of reindeer mittens. I would love to see how they look when used 2 one-colored yarns. 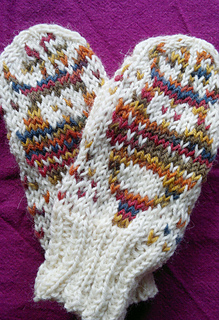 I made these mittens for a 5-year old, but I didn’t get to fit them until they were finished. The size was quite alright. Instructions are very basic, you need to know how to read a chart. EDIT 8.11.2015: Instructions for the thumb: When thumb is reached (marked on yellow), slide 6sts on a piece of scrap yarn. Cast 6sts. Keep on knitting. After the mitten is done: Pick the 6sts + 8sts from the thumbs edge and remove the scrap yarn. Knit 4cm and dec 1sts on each needle until you have 6sts. Cut the yarn and pull them through the remaining sts, tighten tog and fasten. 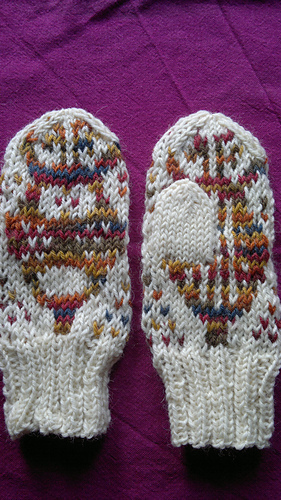 On the other mittens, make the thumb on the other yellow marked sts.